You hear a song walking down the street, and pull out your phone to Shazam the song in order to get the name of the artist. Next, you look up other songs by that artist, and begin to download those to your phone. Finally you’re hooked and want to see them live. Thats where Gigbeat steps in. Gigbeat is an android app that scans your device’s music library for artists and shows when and where they will be on tour. Gigbeat is the brian child of coding engineer, Michael Novak. 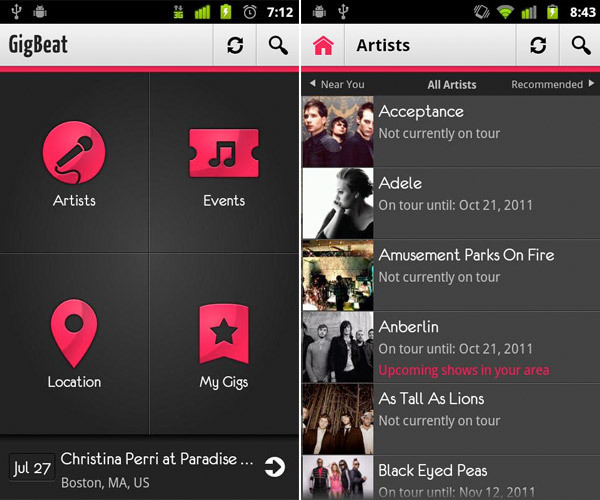 The development of Gigbeat began in February 2011, with planning for the app starting in November of 2010. Novak was inspired to create this app after using a plug-in on his desktop which notified him of concerts for artists in his music library. Based on initial user reviews, they too find this information useful on their phones. “I don’t go to concerts much because I don’t really know when there happening,” said Lilly Anderson a student at Temple University in Philadelphia. “Thanks to this app, I may check out a concert featuring my favorite artist.” That is the beauty of the app, Gigbeat does the work for you. Gigbeat not only benefits users, it also potentially helps to generate concert sales. Currently if the user doesn’t have music loaded onto his or her device, Gigbeat allows you to log into your Soundclick or last.fm accounts in order to sync your artists from these services. However, Novak hinted toward future ways that users may allow Gigbeat to scan their favorite artists. Further implementation of social media will be rolled out during the next update. With the popularity of location based apps such as Foursquare, users will soon be able to “check in” while at a concert, allowing their friends to be notified socially of their current location. Novak also said that deeper integration with Facebook is in the works for Gigbeat and as technology continues to evolve Gigbeat will also continue to evolve. Gigbeat will connect to your social network, allow you to mark that your going to a show and find people that are in your social network interested in going to that same show, said Novak. Gigbeat is currently only available for Android devices running 2.1 or higher and is also compatible with Tablets that are running Honeycomb, however Novak did mention that it’s a possibility that Gigbeat could be making its way to other operating systems such as Apple’s iOS or Windows Mobile.